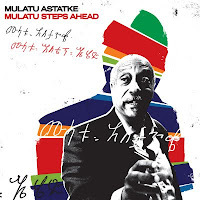 Seemingly right on the heels of his retrospective album New York, London, Addis, Ethiopian jazz great Mulatu Astatke (a.k.a. The Father of Ethio Jazz) shows that he's not standing still with nine tracks ranging from the mellow introspective jazz of "Radcliffe" to the Ethio-Latin sizzler "Boogaloo" (which yes, has hints of the Batman TV theme). The emphasis for much of the album is more on the jazz than the Ethio, with hints of the African coming via a solo here, a chord change there -- and the casual listener might not even mark those tracks as particularly exotic. Only on "I Faram Gami I Faram " and "Mulatu's Mood" are the ethnic roots forefront, and perhaps not surprisingly those are my favorite tracks along with the simmering kora-horn-piano-vibes instrumental "Motherland." “I desired to ingest West individual styles within this edition and essay newborn structure of using the bonny good of the kora,” explains Mulatu in his own curious vocabulary. The digital album includes the bonus song "Derashe" which sounds like a free-jazz rehearsal but in fact highlights the diminishing scales of the Derashe grouping of Southern Ethiopia which were integrated into compositions by the likes of Debussy and Charlie Parker. Though Mulatu is taking a step more toward jazz with this release, there's plenty of appeal for the fan of Ethiopian roots. And his clever integration of styles makes the music work even as your brain is going "huh??" Lean a bit more about the history of Ethio jazz in this interview with Mulatu -- including how Ethiopia's emperor traveled to Europe in the 1960s and invited some Armenian musicians to teach European instruments to Ethiopian musicians, thus starting this whole crazy and wonderful musical ride. On sale March 30.